Many believe our limits are defined by physical traits, but Alex Hutchinson knows that limits only exist in our minds. An award-winning science journalist, Alex draws on his experiences as an elite long-distance runner for Canada’s national team and as a scientist to explore the limits of human performance and understand the subtle factors that define champions. His New York Times bestselling book Endure: Mind, Body, and the Curiously Elastic Limits of Human Performance was recently a featured read for the Next Big Idea Club curated by Malcolm Gladwell, Susan Cain, Adam Grant, and Daniel Pink. Shortly after competing in his second Canadian Olympic Trials, Alex decided to leave his postdoctoral physics research post with the U.S. National Security Agency to pursue a master’s degree in journalism — and has never looked back. 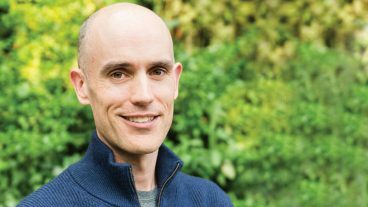 He is currently a columnist and contributing editor for Outside and Canadian Running magazines, and also writes for the New Yorker’s Elements blog on science, endurance, health, and human performance. He is most well-known for debunking health and fitness hype as the Globe and Mail’s Jockology columnist. In 2008, Alex received a U.S. National Magazine Award for his work covering technology for Popular Mechanics, and in 2012 he received a Lowell Thomas Award for his travel writing in the New York Times. Alex has a Ph.D. in physics from the University of Cambridge and graduated with a master’s degree in journalism from Columbia University. He has given talks on endurance and human performance to audiences ranging from the Canadian Olympic Committee’s Own The Podium program to investment bankers and funeral home directors. When you push to the point where you can’t go any faster or continue any farther, what’s holding you back? For centuries, physiologists assumed that the answers lay in our muscles or lungs or blood vessels. But over the past decade, a wave of new research—along with the exploits of mountaineers, freedivers, and other extreme athletes—has shown that our ultimate limits reside in the brain. In other words, endurance is simply “the struggle to continue against a mounting desire to stop”—and the resulting insights about how to push through those brain-imposed barriers apply as much in the boardroom as on the playing field. In May 2017, marathoner Eliud Kipchoge ran 42.2 kilometers around a Formula One track in Italy in an astounding time of two hours and 25 seconds, bringing the long-rumoured two-hour barrier within reach. This race was the culmination of a multimillion-dollar Nike “moonshot” project, and of decades of gradual progress toward the ultimate limits of endurance. Alex Hutchinson was one of two journalists granted exclusive access to the Nike project, and he presents a fascinating behind-the-scenes look at what it took to run the fastest marathon in history—and how technological innovation and human factors can work together to take performance into uncharted territory. When you push to the point where you can’t go any faster or continue any farther, what’s holding you back? That’s the fundamental question that science journalist and former elite runner Alex Hutchinson wrestles with in this New York Times bestseller. Mixing astonishing tales of Antarctic explorers, freedivers, and other extreme athletes with his own visits to labs around the world where he tries performance-boosting techniques like electric brain stimulation, Hutchinson reaches a remarkable conclusion: Our limits, even those that feel purely physical, are set in the brain—which means they’re negotiable. In this book, Globe and Mail science columnist Alex Hutchinson tackles 111 common questions on exercise, fitness, and health, ranging from “How long does it take to get in shape?” to “Will a post-exercise ice bath help me recover more quickly?” The catch: the only answers he gives are those based on scientific research, rather than opinion or tradition. That means there aren’t simple, pat answers to every question—but the surprising takeaway is that getting fit is more straightforward than you might think. We invited Alex to speak to a group of young players during an off-season development program in Toronto. Alex’s research and message related to pushing past the assumed boundaries of performance was particularly relevant for this group, as they challenge themselves to go from talented minor league players to winning Major League players. Alex’s content, story-telling, humility, and humor kept us fully engaged and we are excited to keep following his work. Alex delivered an entertaining and informative presentation. The packed room was enthralled. Clearly, Alex knew his stuff. Moreover, as an accomplished athlete himself, he was able to add more colour to the science by linking it to personal anecdotes which really helped build a connection between Alex and his diverse audience. Alex’s talk was a definite highlight of our program. Alex has an incredible way of translating complex health and performance topics into easy and clear understanding for any audience. There is much to learn for all us from the lessons from the coal face of elite sport, as well as the everyday application of health and wellness. In the end, Alex presents concepts with engaging stories, and wraps it up with thought-provoking life lessons as well. I would highly recommend him again.